Abrem Guest Accommodation offers 5 clean, neat and stylish comfortable twin rooms. One self-catering unit for three people with own secure parking. Every room has his own bathroom and toilet, tv, honesty bar, safe, entrance and secure parking. You can come and go as you please, a place where you can feel at home and still be pampered with a good breakfast on your doorstep and excellent service. Beautiful garden with swimming pool and water fall. Braai and lapa with bar. 3 km. from the new ( still in progress ) Amakozi Soccer Stadium. 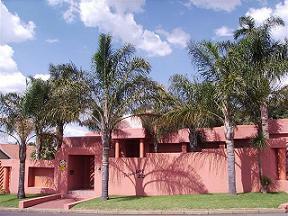 Walking distance from Monument and Noordheuwel Highschool. 3 km. from Krugersdorp en Bell straat Hospitals. 20 km. from Maropeng The Visitor Centre For The Cradle Of Humankind. We are looking forward to accommodating you!